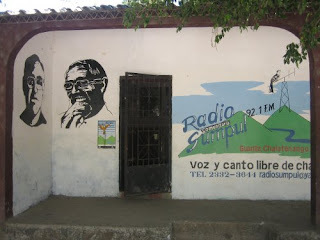 Radio Sumpul is noncommercial, community radio broadcasting from Guarjilla in Chalatenango province. 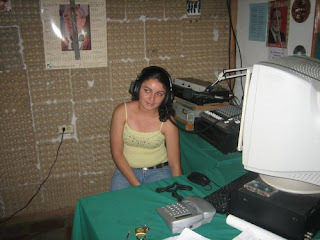 It is part of a network of community radio stations stretching across El Salvador known as ARPAS. Radio Sumpul, like other stations in ARPAS, plays a variety of music, news and educational programs for all ages of listeners. The operation at Radio Sumpul is staffed by volunteers. One of the staff explained to me that the volunteers, most of whom are women, work at the station because they are commited to the project and because they are able to gain experience working with the technology of an actual radio station. Radio Sumpul and the other radio stations do not accept political ads from any political party. Accepting ads or endorsing candidates could jeopardize their ability to function independently. Radio Sumpul is named for the Sumpul river, and in memory of the massacre that occurred there in 1980, in which more than 600 people were killed by the Salvadoran and Honduran armies as they attempted to flee the war by crossing the river to safety in Honduras. As the war raged on, through the 1980s and early 90s, many people decided to return to their communities. Radio Sumpul is coordinated by CCR, (Rural Communities of Chalatenango), a branch of CRIPDES (The Association of Rural Communities for the Development of El Salvador). CRIPDES was founded in 1984 by refugees of the war. They organized themselves and returned to their communities, even while the war was still raging on. Today the groups focus on organizing in their rural communities for social and economic justice. In a country where television and newspapers are dominated my major business interests, and where internet access is limited, Radio Sumpul and the other community radio stations provide an important independent voice on the Salvadoran airwaves. I've been to Guarjila several times and know many of the wonderful young folks who participate in Radio Sumpul. Thanks for featuring the work they do! I find it hilariously delicious that these community radios were denied permits over and over (and shut down) before the 1996 law that did away with the corrupt ANTEL state enterprise. The lefties complained when ANTEL was privatized and stripped of its regulatory powers; yet it was the aggresively innovative and rather professional SIGET that arose from the 1996 law that finally sold these community radios the radio spectrum that allows their continued existence. Goes to show that "popular" "community" organizations often fail to realize that what's good for El Salvador is good for their communities. SIGET didn't just sell a frequency to the community radios. The community radios, through their national organization ARPAS, had to fight for years for these frequencies. SIGET like ANTEL did not act on the community radios requests for frequencies. The ARENA party pushed through legislation -- in a secretive dawn vote, in one case --which changed the regulatory framework, circumventing National Assembly negotiations to create a real space for community-based, socially responsive mass media. Rather than allocate a non-profit sector of the spectrum, as most countries do, these new regulations forced the community radios to raise money to buy a frequency or risk losing them by auction to the highest bidder. The supposedly professional SIGET didn’t serve the community radios much better than ANTEL did; the only reason the community radios exist is the massive support they had from all progressive sectors -- non-profits, human rights organizations including the Human Rights Ombudsperson’s office, journalist’s organizations, unions, the U.N., and from the municipalities themselves, regardless of party affiliation. State-owned ANTEL: repeatedly rejected community radio applications, had them shut down via police raids. Post-ANTEL privatization: licenses transparently, ethically, and fairly sold to highest bidder, including community radios. Community radios are now legal. You can spin it any way you like it, SIGET made it happen, corrupt ANTEL could never have. ANTEL = Government by militars. SIGET = Government by civils. Differences: ANTEL was corrupt. SIGET rules by clearly laws and transparency. "ANTEL was corrupt. SIGET rules by clearly laws and transparency"
It sounds like the old trick they always do to privatize.. They almost say it: "State is corrupt and private is not", but the only reason why they don't say it that way is because ARENA is the "government". I hope you're being sarcastic, Soy Salvadoreño. The government had been sent to shut down the radio during the war. They attempted to confiscate all of their equitment but the townspeople of Guarjila blocked all of the roads leading out of the town. A deaf woman (only 12 at the time) jumped on the back of the pick-up truck as it tried to get away with the equitment and was slashed in her arm by a soldier. And tomas is very correct in saying that the young people who run the station are incredible.